Tap into the mysteries of psionics, using sheer force of will to allow psionic characters to let loose power to rival any physical force or magical energy. Contained in this book, you will find the secrets of psionics, the magic of the mind. • Eight psionic races to create new characters, from the blue, to the elan, to the serpentine ophiduan. 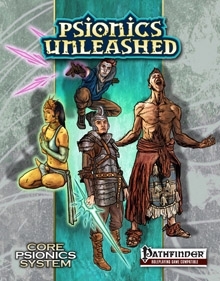 Updated to support the rules of the Pathfinder Roleplaying Game, Psionics Unleashed contains everything needed to easily integrate psionics into any campaign, including characters, items, monsters, and powers. Psionics Unleashed is available at RPGNow.com.